Looking back, 1997 was rather lively. It was the year that brought us the weblog, the camera phone, and the registration of a website called Google. And Britain appeared to be fizzing with creativity. On Blue Peter the hot literary tip was a new novel called Harry Potter and the Philosopher's Stone and the nation's tots were whipped into a frenzy by the new sensation in pre-school TV, the Tellytubbies. In art, the Sensation exhibition marked the highpoint of Britart and at the movies The Full Monty was an international hit. Britain even won the Eurovision Song Contest. It was such an exciting ferment that the government issued a series of press releases about "Cool Britannia". What you might not remember is that the department that issued them was the Department of National Heritage and that the government was led by John Major. 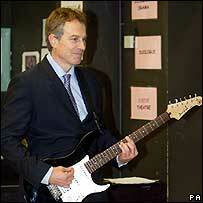 Nevertheless when New Labour arrived in Whitehall the "Cool Britannia" brand clung to them and their "cool" leader. And culture was a central part of the plan to modernise Britain. The Department of National Heritage, which sounded to some like a body that was only interested in preserving an old and crumbling country, was turned in to the Department for Culture, Media and Sport. It was all rather European and trendy. This was a government led by a prime minister who had been in a rock band called the Ugly Rumours, he had had long hair, he could head a football. 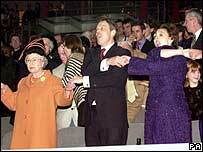 Ten years on we perhaps forget how much the cultural mood music of government changed. The message it wanted to send out was that this was a shirt-sleeved government totally unlike the buttoned-down years of Thatcher and Major. This was a prime minister who looked at ease talking about the nation's pain following the death of Princess Diana and could join in the campaign to free Coronation Street's Deirdre from prison. There was a strong political thread to all of this, a need to be seen to be "in touch". But it also reflected a new ambition. Advisers such as Geoff Mulgan saw it as part of a new approach in which the government would take a central role in championing the role of the creative industries. The concept of culture expanded and embraced fashion, pop music and video games and the new government wanted to be involved in it all. Arts leaders looked on excitedly awaiting a flood of cash to revitalise theatres, cinema and galleries and museums. Committees were set up looking at how to change things and parties were held in which pop stars, actors and fashion designers trooped in to meet political leaders. And the showpiece of New Labour's New Britain was to be a huge celebration in London at a building called the Millennium Dome. Ten years on and the long hangover is still with us. Expectations were so high they were always going to be disappointed. The fashion designers wanted government cash that was never going to come and the pop stars soon realised cocktails at Downing Street dented their rock and roll credibility. And the Dome was not quite the success it was hoped for. New Labour ditched Cool Britannia as quickly as it could and Tony Blair spent the next few years not talking about the arts or pop music or the Dome. When the criticism came that this was a government obsessed with image and spin rather than delivering better public services, it was time to ditch the pop star parties. As the years went on they were among the first to lose interest in the "once cool" prime minister. There was even a name for them: "Luvvies Labour lost". But just when the rhetoric shifted, the reality on the ground did change. Funding for the arts increased. Entrance charges for the national museums were scrapped and a series of new lottery funded venues and artworks were unveiled. There were grumbles that Tony Blair did not visit the opera and only valued art for what it did for the economy, but many acknowledged that it was better than it had been for many years. And then just before he left office he did finally make a keynote speech about the importance of the arts. The Tony Blair who had been accused of presiding over a "dumbing down" of Britain and a philistine obsession with celebrity and pop music spoke up for art for art's sake. Many in his audience were convinced, and then dismayed when a few days later they heard that there would be a small cut in funding for the arts. But when future historians analyse Blair and the culture of Britain, it is going to be tough. For some it's a shallow and celebrity-obsessed era, led by a shallow and celebrity-obsessed prime minister, with the only measure of art being its ability to create jobs and meet social targets. Others might point to a booming British film industry, rising audiences at our theatres and the success of our museums. But one thing is certain. The early enthusiasm for talking about transforming our culture and expanding the government's role in it was always going to mean that he was opening up a whole new collection of largely ungovernable things that he would be answerable for. 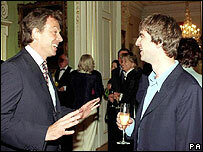 It was during John Major's tenure that Britain produced Britpop, the Spice Girls, Trainspotting and the Full Monty. No one would blame him or thank him for any of them. However, it is already apparent that people will talk about the last 10 years as Blair's Britain and, just as with Margaret Thatcher, his influence will be seen in everything from movies to binge drinking, gambling and the antics of reality TV contestants. How will history judge Blair?